I'm Rachel, a 30 year old Londoner with a background in environmental project management in local government. After taking the PDC with Social Landscapes in 2017 I started volunteering to learn more about permaculture and ended up working as the Project and Communications Coordinator for Ecosystem Restoration Camp Altiplano in southern Spain. Ecosystem Restoration Camps is a growing, grassroots movement dedicated to creating places for people to learn about and practice Ecosystem Restoration. 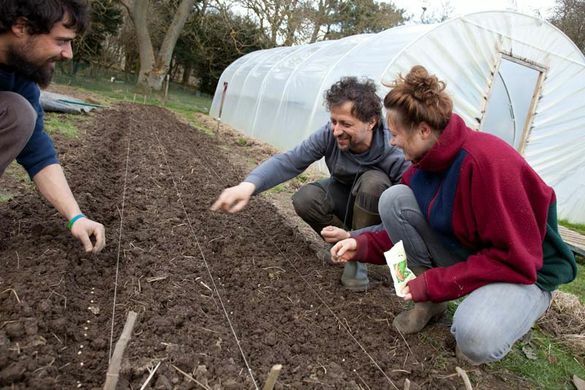 The PDC (Permaculture Design Course) taught me that we can aim for more than just being 'sustainable', that in fact we can create regenerative cultures and food systems which leave a positive footprint on the Earth. At Camp Altiplano in Spain I've seen first hand what that might look like and how agriculture could help to build soil health rather than destroy it. We're working with a cooperative of local farmers (AlVelAl) to support a transition to regenerative farming and to reverse the desertification and depopulation of this rural area. We're developing an agroforestry system (designed using a permaculture approach) which is intended to be a case study for other farms. Hundreds of people from all over the world support us through donations or by coming to volunteer and learn with us. To find out more about Ecosystem Restoration Camps and how you can join in, visit www.ecosystemrestorationcamps.org. The experience of working here has shown me how much can be achieved when even just a few people organise themselves around a shared vision and collaborate to achieve it. The permaculture principle I remind myself of most often is 'small and slow solutions'. I find it useful to remember that change will not happen overnight but can be reached step by step with patience, thought and determination. Since taking the PDC I feel far more hopeful about the future and empowered by the tools and techniques I gained. In using them I've seen it is possible not only to restore the land we depend on but also to restore ourselves and our connection to nature in the process. My name is David Satori, 23, and I am a teacher, gardener, and mycologist, running a new project: Myceliate. It is an educational organisation dedicated to teaching the public on the wonders of the fungal kingdom and the potential that fungi have to offer to our health, the health of our ecosystems, and the sustainability of our society. From the very beginning, the guiding light for this project has been Permaculture, and especially the principle of producing no waste. I learned that fungi can be the tie that binds many of our “outputs” back to our “inputs” - turning loose ends into full circles. Whether it is recycling organic matter back into soil, or breaking down toxic pollutants into harmless compounds, fungi hold the key to the principle of Zero Waste. With this project, I aim to make the public more aware of the importance of fungi in our present lives, and the increasing importance they will have in our future - from food, to medicine, to ecological restoration - and how any one of us can become better stewards of the land by working with fungi. Whether you are a gardener, conservationist, or just plain curious, there is plenty for you to explore through Myceliate. To get involved in this project, please visit my website to see upcoming workshops, talks, and my writings on ecology, gardening, and conservation. Myceliate is also on Facebook and Instagram, and is happy to field any queries you may have! The more I learn about fungi, the more I realise that they may in fact be the world’s original permaculturists. Hi my name is Marcello, I'm 44 and I live with my wife Antonella and our child Martino in North Yorkshire, England. We're members of the Esk Valley Camphill Community where we live and work alongside people with learning disabilities. I'm a biodynamic gardener and my role in the community right now is to build a small-scale sustainable farm and to lead a team of young volunteers and residents with special needs. Because we've just acquired new land I thought to attend a permaculture course in order to have an overview of all the elements involved in building a sustainable "organism". The course lead by Michel Thill was really engaging, learning how to read situations and look at patterns and design from so many different angles. Permaculture is a lot about learning from nature and teaches us to sharpen the tool of observation. The Permaculture Design Course is the beginning of a journey where we start looking at things differently with more awareness of our actions and decisions. It is a way for learning to work together with nature but also among us humans. The course I attended is especially designed to teach people to work in teams. In the work I do, the biggest goals are to give purpose to other people, to give motivation but also to listen and accept many different points of views. In order to do this we need to constantly work on our way of thinking and perceiving. After a period of planning and discussions we finally got the land on which to build our small farm. Now that the growing season has started, everything is particularly hectic and extremely exciting at the same time. You can find us on Facebook and Instagram @ Esk Valley Camphill Garden. I hope to see you here one day if you wanted to join our community either for a short or long term period.